The world-famous palace, fountain and park ensemble of Peterhof, often called the «Capital of Fountains», is situated 30 km from the center of Saint Petersburg. Without any overestimation Peterhof can be called the main gem of Saint Petersburg's «pearl necklace», as unique suburbs of the city are often called. The history of Peterhof dates back to the reign of Peter the Great. The Emperor regularly traveled from Saint Petersburg to Kronshtadt to oversee the construction works. In order he could rest during the long and wearisome trip several wooden houses were built on the place where Peterhof would later appear. In 1714 Peter the Great conceived the creation of a splendid official royal summer residence that would in its splendor overcome French Versal. The Emperor himself took part in the design and construction of the palace — numerous drafts, working drawings with the marks and notes of the tsar have preserved till nowadays witnessing that Peter the Great worked not only on the general layout of the ensemble but created smallest details of the architectural constructions and fountains. Due to the active interest of Emperor the construction works were carried out at a fast pace. By 1723 Lower Park had been already laid out, the Sea Channel had been dug out, the Monplaisir and the Chateau de Marly had been built, the Upper Chambers had been decorated and the majority of the fountains were functioning. In the same year the solemn ceremony of the gala residence opening were held. 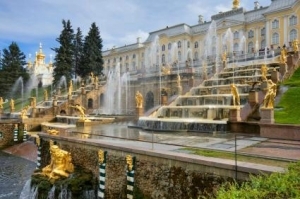 The main attraction of Peterhof is its hundreds of fountains, each unique in style and decor. The most treasured among them is the famous Great Cascade designed by Peter the Great. This grandiose fountain construction unmatched in the world is shaped as a grotto with stairs-waterfalls on the both sides. The Samson Fountain with a great spewing lion became the brightest monument to the glorious victory of the Russians over the Swedes in 1709. Its symbols can be easily interpreted as the lion was depicted on the coats of arm of Sweden and Peter the Great was often compared with Biblical Samson. The wonderful parks, countless fountains of various forms and styles, cascades, majestic palaces, numerous gilded statues of ancient gods and heroes were to demonstrate the might and glory of Russia that had turned into a navy state and become firmly established on the Baltic Sea. World War II became an ordeal for Peterhof. It was occupied for 3 years and during this time the Nazis blasted and burnt the Great Palace, severely damaged the Great Cascade and the cascades of the Gold Hill and the Chess Hill, destroyed the underground systems of water pipes, cut down the trees, dug and mined the parks, took away many statues, the famous Samson among them. Only due to the efforts of hundreds of experts, restorers and artists modern visitors can again admire the unique beauty of Peterhof, that represents the harmony of art and nature. The gleaming gold, the exquisite architecture and the splashing of the fountains create the most impressive sight.